Goblin Hut is one of the most underused cards in Clash Royale as most players put it in Spawner deck. I am not saying that Spawner Decks are all bad. I faced some great Hut Decks in Arena 9 but truly the current meta game is not for them. Also, you don’t have to always put the Goblin Hut in Spawner Decks. This card is absolutely viable in other decks. Goblin Hut is a rare building card costing 5 Elixir and is unlocked at Arena 1 (Goblin Stadium). Due to this Goblin Hut will mostly be the first building you unlock in the game. Spear Goblins have a remarkable ability to snowball (come together and form a big Horde). Even if a card a Mini tank protects them, they can snowball and deal suprisinly a lot of damage and that is why don’t underestimate the Goblin Hut. Want to see your opponents groan as they are using the Prince on a lane where your Spear Goblins running down every 2 seconds? Want to deal with Lava Hound much easier? Want to make the opposing Sparky going off all the time? Want to make your opponent panic and dealing with the annoying sounds the entire game? Give the Goblin Hut a chance! 19/4/17, increased the Goblin Hut’s hitpoints by 5%. 9/10/17, increased the spawned Spear Goblins’ hit speed to 1.1 sec (from 1.3 sec). 24/1/18, decreased the spawn speed to 5 sec (from 4.9 sec). To chip down your opponent’s Tower and his soul. To stop Princes and Sparky. To deal with air threats passively. To add extra power to the counterpush. To build the passive Elixir advantage. To control the pace of the game. To soak damage in emergency defense. But my Goblin Hut is underlevel! No worries! I believe that the Goblin Hut is one of the least level-dependent cards in the game. Spear Goblin always gets 1 hit to the Tower. If it’s so good, what do I take out for it? Use the Goblin Hut as the win condition’s support. Neither your opponent. So deal with it, or mute the game! This part is a very important part of the guide! Whenever I suggest someone to use Goblin Hut they are like ‘Nah! I will use Furnace instead.’ So this part is dedicated to those. 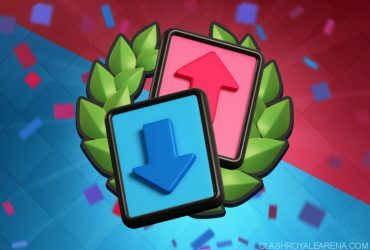 And the recent balance changes has reduced the difference between them so this will help you understand which card you should use. Note: All stats are at the tournament levels. → Goblin Hut cost 5 Elixir while the Furnace costs 4 Elixir. → Goblin Hut has 1,293 HP while the Furnace has 1,003 HP. → Goblin Huts lifetime is 1 min (60 sec) and that of Furnace is 50 sec. → Goblin Hut spawns one Spear Goblin every 4.9 sec (13 Spear Goblins in all) while the Furnace spawns 2 Fire Spirits every 10 sec (10 Fire Spirits in all). → For 5 Elixir you get Spear Goblins who cost 8.6 Elixir (3.6 Elixir more) while for 4 Elixir you get Fire Spirits who cost 6.6 Elixir (2.6 Elixir more). Goblin Hut gives more value than Furnace. For Goblin Hut, each Spear Goblin deals 50 damage so for 13 Goblins the damage is 650. For Furnace, each fire Spirit deals 169 damage so for 10 Fire Spirits it is 1690 damage. However, a lone Tower at equivalent level 2 shots one Fire Spirit so only 1 reaches per wave. So actual damage is 845. Now, you may be thinking that after all this comparison Furnace deals more damage but this is only at equivalent levels. On the ladder you face opponents with towers at a higher level and a Fire Spirit can be one-shot by a Tower which 1 level higher than it. So basically, the 850 Tower damage disappears. On the other hand, a Spear Goblin regardless of its level gets one hit on Tower(even if the Spear Goblin is at level 1 and Tower at lvl13) because of its quick initial attack. So, even if you face a higher level Tower, you are guaranteed 650 Tower damage. This tells us that Goblin Hut is more viable on the ladder while Furnace is more viable in challenges. Also, one important point is that Fire Spirits only deal particular amount of damage because they die in doing so. However, Spear Goblin’s damage varies as they don’t die so as long as they are protected they can keep dealing damage and even cross the damage of the spirits. Goblin Hut is more tankier than Furnace and costlier but it is more viable on defense as it can tank more than Furnace and Spear Goblin can distract troops as they are ranged. Furnace is less tankier and cheaper than Goblin Hut. But it offers more damage so it is more viable on offense than on defense. The placement of the Hut differs as per the way you use it. Defense building means to tank damage from troops and less offense while offensive building means when there are two buildings and Goblin huts role is not for defense but for offense. As a defensive building: When using Goblin Hut as a defensive building make sure that you have a tank killer in the deck because the damage of the Spear Goblins increases slowly which is not good on defense, basically the Hut tanks. For this, the Goblin Hut should be placed in the center of the arena near the cross-fire area for optimum pulling and defense. Behind the Princess Tower and in the corner of the map: This is the position I like to start a battle with as I use it as an offensive building. This is a good position as the Hut is well protected and ideal for a start. In front of the king Tower: I mostly use this position when the opponent has Miner or Rocket. Miner dies quicker in the cross fire area and the Hut survives with more HP. If opponent uses Rocket, the Hut will be destroyed but our Tower won’t receive any damage. (-1 Elixir trade + no Tower damage = bad play XD) I also use this position against heavy tanks because if they destroy the first building they will be kited to the Hut. When you see a Goblin Hut, the first thought that comes to your mind will most probably be Hut Spam. Now, I know that Hut spam is a hated technique and it doesn’t require skill. So, an effective way to use Goblin Hut without criticism is in Hybrid Decks. An hybrid deck is a deck which is a combination of 2 deck types for E.G. 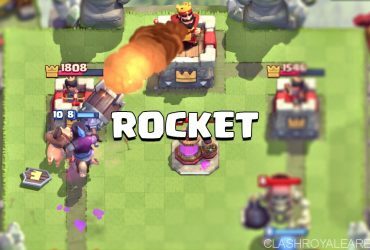 Hog Mortar Cycle (Cycle-Siege hybrid), Royal Giant Mortar Hybrid (Beatdown-Siege hybrid), Giant musk Zap bait (Beatdown-Spell Bait hybrid). Hybrid decks are hard to make and hard to master. But if you successfully create a good one and master it, the deck will take you very far as these decks are difficult to defend against. Hut Spam-Beatdown hybrid: This type of deck mostly uses Giant or RG as a win condition along with Goblin Hut. The Spear Goblins effectively snowball behind these slow tanks and deal a lot of damage. Example: Royal Giant, Goblin Hut, Witch, Electro Wizard, Knight, Minions, Fireball, The Log. Hut Spam-Control Hybrid: This is the combo I use. This type deck utilizes Miner or Battle Ram as main win conditions. Miner offers insane chip damage and is very popular in control decks and even 1 Spear Goblin when protected by Miner can deal pretty good damage as the opponent ignores one Spear Goblin. Battle Ram and Barbarians from it can effectively tank for Spear Goblins. Example: Miner, Goblin Hut, Ice Wizard, Valkyrie, Minions, Poison, Zap, Inferno Tower. Hut spam-Spell Bait hybrid: The Spear Goblins have ability to snowball so the opponents mostly try to Zap or Log them. So it is a great card in spell bait decks utilizing either Miner or Giant(Hog Rider sadly doesn’t synergize well). Example: Giant, Musketeer, Goblin Hut, Skeleton Army, Minion Horde, Goblin Barrel, Fireball, Zap. That’s all I have to say today. Hope you guys enjoyed reading this and try out the Goblin Hut.